Located in the neighbourhood of South Etobicoke, Phoenix will be a community for those who know that your home should be a place where everything slows down. Empire Phoenix Condos is a new condo project by Empire Communities and is currently in pre-construction. Empire Phoenix Condos will be located at 252 Manitoba Street in Toronto. Empire Phoenix Condos will be two towers of 29 & 11 storeys with 499 units. The building will feature ground level townhomes. Amenities at Empire Phoenix Condos will include an outdoor pool, shared workspace, fitness centre, spa with steam room, treatment room and relaxation area, outdoor terrace with BBQ and dining area.Phoenix offers easy access to both Toronto’s downtown core and the GTA’s suburban neighbourhoods, as well as a connectedness to nature often hard to achieve in a condominium community. Empire Phoenix Condos Etobicoke is a new condo project by Empire Communities, and this new development will be located at 251 Manitoba Street in Toronto (Queensway/Park Lawn). It has a walk-score of 63 and transit-score of 83/100. It has quick access to the Gardiner Expressway and QEW, very Close to the Humber Bay Park, 3-minute drive to the Mimico GO Station, 15 minutes drive to Downtown Toronto, close to shops, restaurants and schools. Nearby parks include Manchester Park, Winslow-Dalesford Parkette and Grand Avenue Park. Empire Phoenix is located in the scenic and established Humber Bay Park-Mimico neighbourhood of South Etobicoke; Phoenix will be a community for those who know that in a fast-paced, hectic city, your home should be a place where everything slows down. 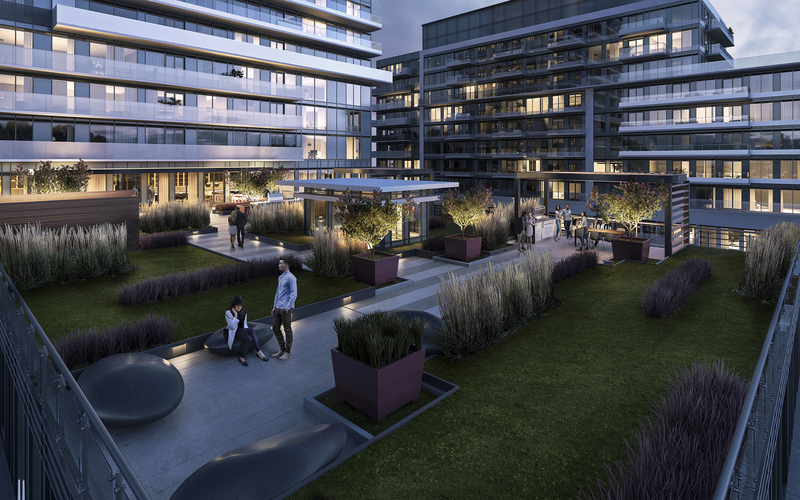 A genuinely connected address, Phoenix offers easy access to both Toronto’s downtown core and the GTA’s suburban neighbourhoods, as well as a connectedness to nature often hard to achieve in a condominium community. Empire Phoenix Condos will be built in the Humber Bay Park Mimico neighbourhood of Etobicoke. It is rapidly becoming a trendy destination for those who want easy access to downtown Toronto while enjoying lakefront living and the pleasures of naturally rolling hills and abundant green space and recreation. It adds the significant portion of the Etobicoke Condos. This secure area is well known for its scenic lakefront parks and extensive leisure facilities. Lake Ontario encompasses it to the south, Dwight Avenue to the west, Evans Avenue to the north and Mimico Creek to the east. Empire Phoenix Condos will feature two buildings, 29 and 11 storeys, with ground level 2-storey townhomes. The Project is sketched by very renowned architect Graziani & Corazza Architects Inc., located at 251 Manitoba Street Etobicoke. There will be a total of 499 units. Amenities will include an outdoor pool, shared workspace, fitness centre, Spa with steam room, treatment room & relaxation area, outdoor terrace with BBQ and dining area.